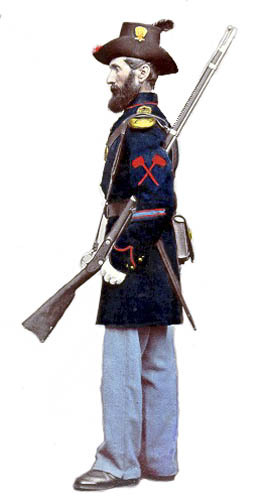 The pioneer's insignia was adopted in 1851 and was cut from material in the branch of service color (i.e., light blue for infantry, red for artillery, etc). The image of the artillery pioneer has one error. His service in war chevron should be red with light blue borders rather than the reverse as shown. This was likely to have been an error that happened when the image was colorized.